New Free Chlorine Probe Design | Chemtrac, Inc.
Chemtrac is now delivering its free chlorine analyzers with a new and improved sensor. With the previous design, it was recommended to replace the membrane cap annually, and the electrolyte was typically replaced two to four times per year. For the new probes, the membrane caps are expected to last for two years, and the electrolyte can last for a year before it needs to be changed. 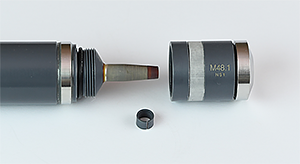 It must be noted that the membrane caps differ and are unique for the respective probe designs, and are not interchangeable. When ordering replacement caps, please be sure to first determine which probe design you have. Then determine the proper part number for the appropriate cap. The look of the electrodes can be compared in the following photos. 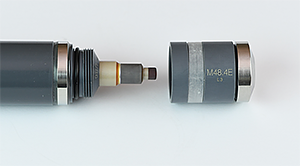 The former Free Chlorine probe design incorporated a small “G-Holder” cap in addition to the primary membrane cap (part #17410). The latest probe has a slightly different electrode configuration and requires only the one updated membrane cap (part #17411).